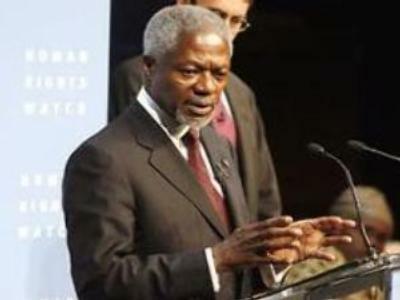 Kofi Annan has reproached the U.S. in his farewell speech as United Nations Secretary General. He called on the United States not to forsake its democratic ideals and collaborate more with other nations in its war on terror. Throughout his 2 terms as Secretary General, Kofi Annan, has not always seen eye to eye with the United States, and his relationship has been particularly strained under the Bush administration. One major issue has been the U.S.-led invasion of Iraq, launched without the UN Security Council’s go-ahead. Mr Annan strongly opposed the war, and has denounced it as “illegal”. Delivering his final speech as Secretary General, Mr Annan urged the United States to show leadership by working with other nations and not by going-it-alone. “Right is Might. That's why this country has historically been in the vanguard of the global human rights movement. But that lead can only be maintained if America remains true to its principles, including in the struggle against terrorism. When it appears to abandon its own ideals and objectives, its friends abroad are naturally troubled and confused,” Kofi Annan declared. As the U.S. reviews its policy in Iraq, Mr Annan used his address to suggest the importance of dialogue with countries, such as Iran and Syria, to help resolve the Iraqi crisis. “We should make them part of the solution. We should make them responsible by pulling them in to work with the international community and tell them what the international community expects of them. I don't think that either country would like to remain isolated forever,” the UN Secretary General believes. Kofi Annan, who steps down at the end of this month, held his final major address at the Truman Presidential Museum and Library. The location is highly significant because Harry Truman, the US 33rd president, strongly backed and helped found the UN. Mr Annan renewed his call for reform of the 15-nation Security Council, saying its membership still reflects the reality of 1945. He recommended adding new members to the council to reflect parts of the world with less leverage, a move the U.S. has opposed. “All Council members, and especially the major powers who are permanent members, must accept the special responsibility that comes with their privilege. The Security Council is not just another stage on which to act out national interests,” he highlighted. Mr Annan left it to his successor, the South Korean Ban Ki Moon, to carry on the baton and, as he would see it, bring the U.S. back into the fold.